The Fast & Easy Cauliflower Rice Recipe, It's So Delicious & Satisfying! The Fast & Easy Cauliflower Rice Recipe, It’s So Delicious & Satisfying! Forget what you know about rice — this recipe is about to change your life! It’s more satisfying than “real” rice, and definitely healthier too. 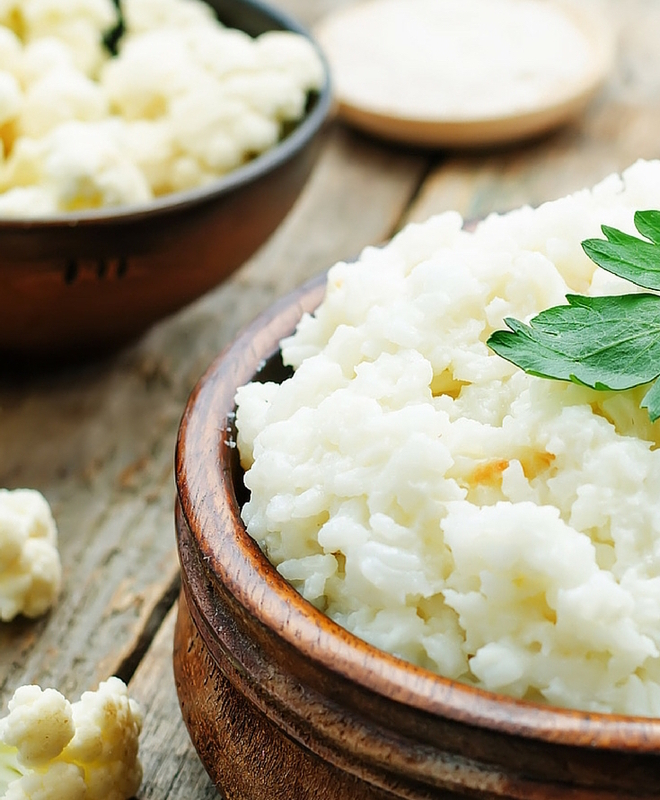 Cauliflower Rice is quick, nutritious and downright delicious! After taking your first bite, you’ll never settle for a basic starch again. There’s only 25 calories per serving. Mind-blowing right?! Just two simple steps and your low-carb solution is ready! Rice has the tendency to make a meal heavy, so it’s nice to replace a typical starch with a light vegetable. In addition, Cauliflower Rice is a great way to squeeze more servings of vegetables into your day! This recipe is so easy and versatile you’ll want to make it every day. No matter what kind of cuisine you’re craving, Cauliflower Rice has got you covered. From Asian stir-fry, to Chipotle-inspired dishes — Cauliflower Rice is about to become your new best friend. “This paleo recipe is so quick, easy, and delicious and really a great substitute for rice if you’re trying to eat low-carb. Your whole family will love it!” – Lauren S.
Heat olive oil in a skillet over medium heat; add cauliflower ‘rice’, salt, and pepper. Cover skillet and cook until heated through, 3 to 5 minutes. Remove lid and fluff ‘rice’ with a fork. Recipe adapted from All Recipes and Don’t Mess with Mama. Looking for a way to use Cauliflower Rice? Try our Sriracha Chicken Fried Rice!